Gulf Craft has launched the first hull of its Majesty 125 series. With a length of 38.4m, the Majesty 125 is the second trideck built by Gulf Craft after the launch of the Majesty 130 named De Lisle III in 2007. Although not known for the moment, her performances should be impressive. Built in composite, like all the former yachts from this shipyard, her semi-displacement hull is powered by twin MTU 16V 2000M93 engines of 2400hp. Different layouts are possible. Gulf Craft presented a 6 stateroom version in the past. 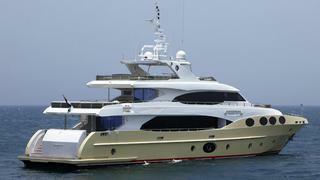 But this first hull accommodates 10 guests in a main deck master, two double and two twin cabins. The two double cabins on the lower deck enjoy great views of the sea thanks to large windows in the hull. The first Majesty 125, spotted under the name Grenadines III, is currently cruising the Côte d'Azur, preparing her future presentations in the different shows of the end of the season. She will make her debut at the Cannes Boat Show, followed by the Monaco Yacht Show and finishing off at the Genoa Boat Show in October. Gulf Craft also confirms the construction of the second Majesty 125 scheduled for a launch in 2012.